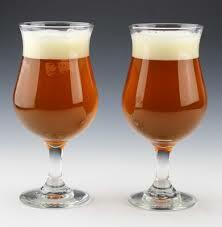 There’s more to the beer glasses than the ubiquitous American shaker pint glass. From the tall and flared German hefeweizen glasses to the diminutive snifters best for holding potent barrel-aged treats, it seems like there’s a particular glass for every style of beer. But you don’t have to collect a cabinet full to best enjoy craft beer; if you only have one glass, make it a classic tulip. Beer nerds (a term of endearment ‘round these parts) are quick to geek-out over “proper” glassware for particular beer styles, and some of the best beer bars in the city take their glassware selection very seriously. Beachwood BBQ is known for stocking more than a dozen different styles of glass (it’s one of the only places in town where you’ll have a Scotch ale served in a thistle glass). But how much difference does the glass actually make? The shape and size of style-specific glasses does provide specific effects. A pilsner glass is tall and thin to best display the style’s clarity and sparkling golden color, while the flare at the top of the over-sized weizen glass supports the voluminous, fluffy head that the wheat beers are prized for. A snifter turns inward at the rim to hold in aromas produced as the beer slowly warms in the hand, and there is even a feature-packed specialty IPA glass developed by glassmakers at Spiegelau and the brewers at Dogfish Head and Sierra Nevada to emphasize IPA’s defining qualities.